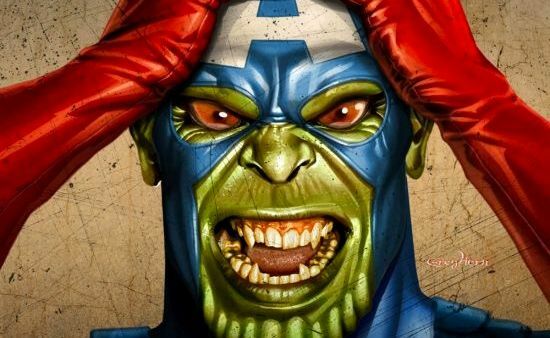 Thanks to a string of Comic-Con character posters and an all-too-brief teaser “button” at the end of Captain America, we already basically know what The Avengers are going to look like come May 4th, 2012. Basically. However, if that wasn't enough, now we have actual pictures of Chris Evans on the set of The Avengers in his entire modern-day Captain America costume - as well as some shots of a strange weapon and explosive (literally) pandemonium. These on-set shooting details could provide MILD or MEDIUM SPOILERS for The Avengers. If you are attempting to avoid spoilers altogether, please be advised to turn away now – you have been WARNED. The mask looks a tad goofier (or maybe that’s just Chris Evans’ smile in that picture) and more stilted than it did in Captain America: The First Avenger. Otherwise the costume looks excellent. The boots, gloves, and underarms are pure Ultimate Captain America, while the wings on the mask are more First Avenger. Everything else seems like a quality mish-mash of 616, Ultimate, and First Avenger - with a little individualized flavor to boot. The big question is, what is that alien-looking hardware? It looks like some sort of Men in Black weapon – not like anything we’ve seen in Iron Man, The Incredible Hulk, Thor, or Captain America. Do these pictures confirm the rumors that aliens – for example, the Skrull and/or the Kree – are at the heart of The Avengers conflict? Additionally, there’s a guy covered head-to-toe in motion capture thingys, indicating that the creatures wielding the weapons (?) are going to be made entirely of CGI. Is that because they’re so monstrous and – dare we say it – extraterrestrial that no amount of practical effects can do them justice? The Daily Mail seems to back up the “aliens are the bad guys” report as well, so those fans who were hoping for an Ultron, Kang the Conquerer, Thanos, or The Beyonder five-way-battle are probably going be disappointed. Marvel is banking quite a bit on The Avengers being one of the most awesome and successful superhero movies ever. Despite his fervent supporters, hiring Joss Whedon was a pretty massive risk – the one feature film he directed wasn’t financially successful and the last two TV shows he was involved in were canceled pretty quickly. And while the first of those shows, Firefly, was and is beloved, the second, Dollhouse, was not so much, to say the least. Still, the man has skills, and if Avengers ends up being the most awesome and successful superhero movie ever – or even just, you know, really awesome – Marvel’s bet will have paid off and then some. How do you guys think Chris Evans looks in the new Captain America costume? And what’s your opinion of aliens potentially being the bad guys? Let us know in the comments. The Avengers hits theaters May 4th, 2012.